Brittney Selby Quilting: Goodbye 2011! 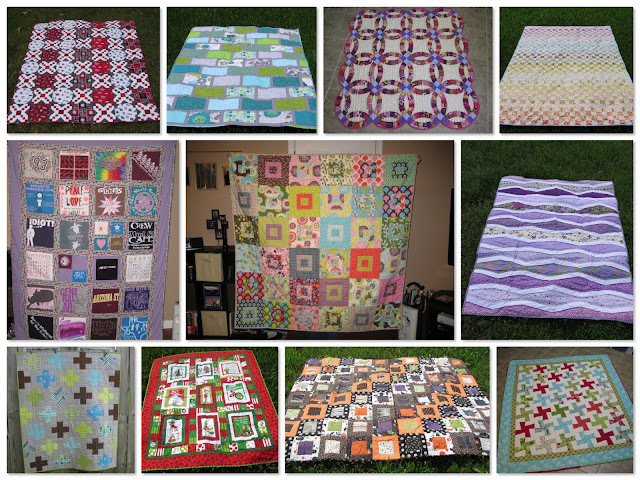 Here are my 12 quilt finishes of 2011. I also started two other quilts that one of which should be completed next. Hopefully 2012 will be as good as 2011. Great-grandma is smiling down on you from heaven! Finally someone in the family with her passion for quilting! You're awesome! We love the quilt you did for Kieran! We got to use it for his newborn picture session a couple of weeks ago. We've had so many compliments from others on it. Just wanted to let you know how much we appreciate it (again)!